This is the first post of a new “Pinspiration” series. So, I have an addiction and it’s to that wonderful little website called Pinterest. I actually refer to myself as “Pinterest Queen” of sorts, and my friends agree it’s an accurate description of my very fortunate addiction. I discovered Pinterest in its infancy, in the summer of 2011, and we haven’t broken up since. It helps me organize my inspiration and stay creative. Pinterest is my therapy. I love that I can pin what inspires me and save the project for a rainy day. Even better, it’s a great way to avoid impulsive online shopping. Fashion pinning helps me rethink my closet and throw together new outfit combinations without breaking the bank. I’m lucky to have some stylish friends to follow on Pinterest and to have found some other inspirational pinners. For this installment of “Pinspiration,” I went through my Pinterest archives to showcase a few of my favorite stylings of cold weather accessories I hope you feel pinspired too! For the past few years I’ve been all about my cold weather boots, and consequently let them dominate my shoe wardrobe during South Bend’s persistent winter. However, this season I’m inspired to instead invest in a few pair eye-catching flats. 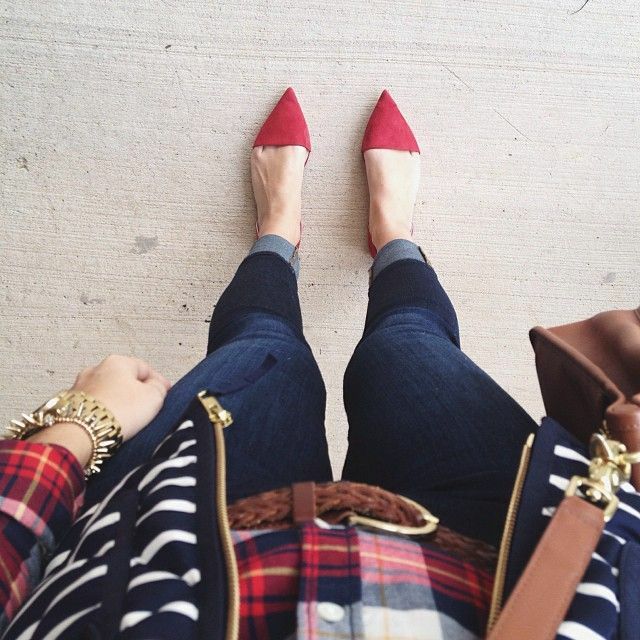 In this outfit, the simple red, pointed-toe flats draw your eyes to the vibrant red in the flannel’s plaid. Just because you wear skinny jeans doesn’t mean you have to stuff them in your riding boots. Let those ankles breathe! Extra Inspiration: Layering in cold weather is crucial when you’re switching from 30-degree temperatures outside to an overactive heating system in the classroom. Don’t be afraid to mix patterns when piling on those layers. Be sure to pull your patterned look together with complementary colors (in this case, red and navy). This pattern mix succeeds because it not only matches colors, but also lines with the stripes and plaid. In my opinion, a stylish and practical scarf is a must-have for every winter wardrobe. Somehow I get the most positive comments on my outfits when I roll out of bed and throw on jeans, a t-shirt and a patterned scarf. The scarf is a magic worker. It not only provides warmth against the chilly South Bend winds, but also jazzes up a simple ensemble. If you’re looking for a carefree, yoga pants alternative for Sunday brunch at the dining hall or that late night trip to the library, make the “scarf, jeans, and t-shirt” look your go-to! Extra Inspiration: An army-green, light jacket is a great fall staple. If you can find a simple style you can wear it on warmer fall days as well as a layer under your winter coat. Socks are perhaps the most underappreciated fashion accessories. We stuff them in our boots, or just let the tippy tops peek out. There are so many fantastic socks on the market these days and I feel guilty suffocating them within my riding boots. That’s why I love this footwear look – cuffed, dark skinnies with mustard, scrunched crew socks and a classic laced low-ankle boot. The best part is your ankles are still kept warm and cozy! Extra Inspiration: Winter doesn’t mean committing your feet to an exclusive relationship with tall boots. Lace up boots at ankle and mid-calf length deserve some dates with your feet too! Whether they’re Hunters or Bean Boots, wellies are a winter essential. I love my leather boots but I hate subjecting them to melting snow and abrasive salt on the walk to class. Therefore, my green Hunters are my winter crutch. But too often do I stuff my skinny jeans in them and call it a day. I get stuck in a jeans rut because it feels “practical.” That’s why I love this Hunter, knee socks and tights combination. Rain boots are great but there’s no reason why you can’t let them work with your outfit. Extra Inspiration: I’m a tights enthusiast but I usually opt for opaque, patterned or sweater tights due to practicality. These sheer tights will protect your bare legs outside but won’t make you overheat in the classroom. Even better, it’s a subtle way of adding color to your legs without having it overwhelm your ensemble. A senior English and American Studies double major at the University of Notre Dame, Katie is passionate about media, education, and public history.